With the fragile interspecies peace that followed the War With No Name under assault from land and sea, Sheba and Mort(e) have no choice but to take up their arms and enter once again into the conflict that threatened to tear them apart. “Repino's dog, cat, and beaver soldiers are nakedly real, as honest as any characters in modern fiction. As horrible as it may sound, may The War With No Name never end." Robert Repino grew up in Drexel Hill, Pennsylvania. After serving in the Peace Corps, he earned an MFA in Creative Writing from Emerson College. His fiction has appeared in The Literary Review, Night Train, Hobart, The Coachella Review, and more. He lives in New York and works as an editor for Oxford University Press. 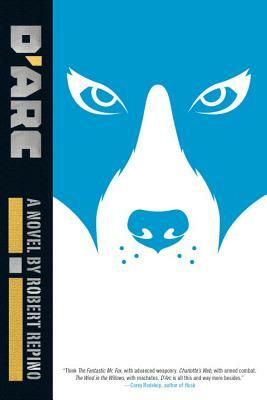 D’Arc follows the novel Mort(e) and the novella Culdesac in the War With No Name series. "From Cordwainer Smith's Underpeople to David Brin's Uplifted dolphins; from Puss in Boots to Brian Jacques's Redwall, science fiction and fantasy are replete with sentient beasts, some more humanized than others. But there has never been another series with quite the punch and heft of Robert Repino's War With No Name saga. Its visceral palpability, hypnotic fatedness, and emotional gravitas make it the War and Peace of beast fables. The latest installment, D'Arc, carries forward the future history of this posthuman world with searing action, unexpected twists and brilliant new characters. Think Margaret Atwood crossed with Robert Stone, and you are maybe halfway to Repino's virtues." "Think The Fantastic Mr. Fox, with advanced weaponry. Charlotte's Web, with armed combat. The Wind in the Willows, with machetes. D'Arc is all this and way more besides. Weaving together threads from dozens of ideas, Robert Repino tops his Mort(e) with an epic allegory at once strange, frightening, funny, and altogether remarkable. Repino's dog, cat, and beaver soldiers are nakedly real, as honest as any characters in modern fiction. As horrible as it may sound, may The War With No Name never end." "The War With No Name series isn't quite a parable, nor does it rely on its novel concept to break ground. These books, intellectual yet elusive, brutal yet tender, imagine what would happen if the natural order of our world were to be fundamentally disrupted. D'Arc in particular takes Repino's conceit to its next stage of evolution. Herein, ocean beasts rise from the deep in search of war, giant spiders terrorize assiduous beavers, animals and humans are in the thick of a battle not just for dominion, but extermination. It is for these reasons and more that I get so excited when I see another entry in the series approaching the shelves. Repino isn't just one of the best writers of his generation, he's one of the most exciting, brave, and unexpected. D'Arc won't just delight your senses, it will change the way you think about storytelling." "Repino crafts achingly real characters from housecats and doggies, and gets you sympathizing with both sides of the in-equation. This is a perfect example of the power of pulp, wild adventure for domesticated humans." "Excellent. This is weird sci-fi at its best . . . The entire series is one of the most unique concepts in contemporary science fiction." ​"T​he action and adventure are fast and fun, and ​[Repino] has successfully created a unique and compelling world. ​This is a fantastically cool read.​"
"Fantastic . . . Well-drawn characters and emotional heft are hallmarks of this unusual series about the power of myth, love, and redemption in a dangerous time." "This follow-up to Mort(e) finds Repino’s humanized animals learning to navigate a new world as they work alongside humans, mourn their past, and deal with intricate emotions, pleasing old and new readers alike."